Downloadable .M4A or .MP3 files. Total size: approx. 250MB. On the basis of some of her recordings it’s easy to write Caniglia off as a bruiser. This Aïda establishes that she was capable of shapely phrasing, rubato, varied and moving colorations, pathos and touching the heart. This is true particularly in the duet with Amonasro–despite an out-of-character, almost comical “Io,” characteristic of all her Aïda recordings. She is sensuous in “Ritorna vincitor!” phrasing it with sensitivity to harmonic structure, and imparts a lovely feeling of upbeat to “I sacri numi,” movng the piece ahead. She surges forward on “Imprecherò la morte a Radamès” and makes a compensatory retard on “a lui ch’amo pur tanto!” In the duet with Amneris she is flat on the high C but affecting in the prayer even if she again goes flat. 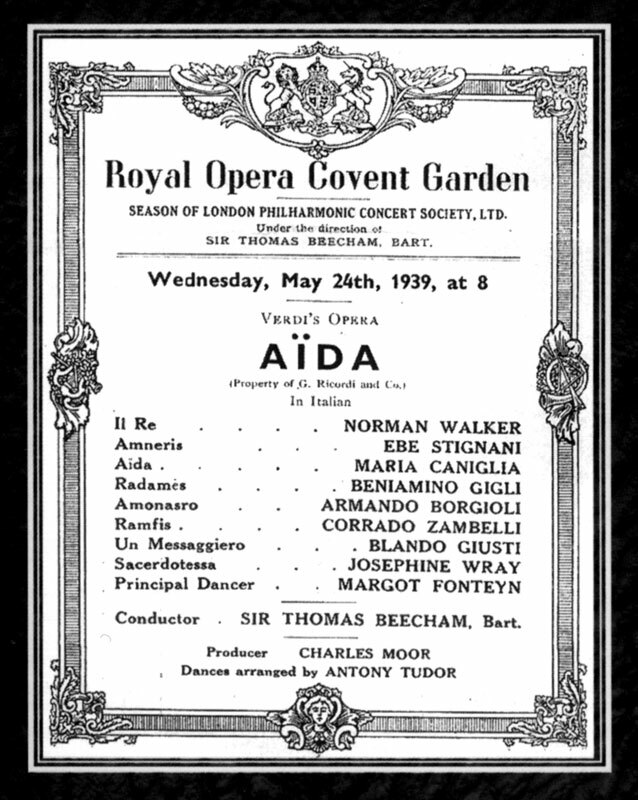 She begins “O patria mia” with a rapt pianissimo, observes the marcato/legato markings discussed in connection with the 1946 Aïda and is touchingly inward on “mai più. No, no.” The notes preceding the C and the C itself are flat. Still, her feeling is beautiful if marred by the occasional glottal attack. She floats a number of high pianissimos, which is unusual for the generation between Giannina Arangi Lombardi and Gencer and Caballé. Unfortunately she sings the final high A flat–and it begins to flutter. Still, on no other recording is she in better voice than here. Gigli’s timbre is lovely, more beautiful than in the 1946 recording, his top notes, in particular. He doesn’t try to force, push or pump up his sound to meet the conventional expectation that Radamès be sung with a heavy voice. Nor does he contrive chiaroscuros, as in Butterfly. For the most part he sings “Pur ti riveggo” with closed tones. He moves ahead the phrase “Sarai tu il serto della mia gloria, vivrem beati d’eterno amore.” And he floats a lovely mezza-voce B-flat. In “Ah no! fuggiamo!” he uses open tones to exciting effect. 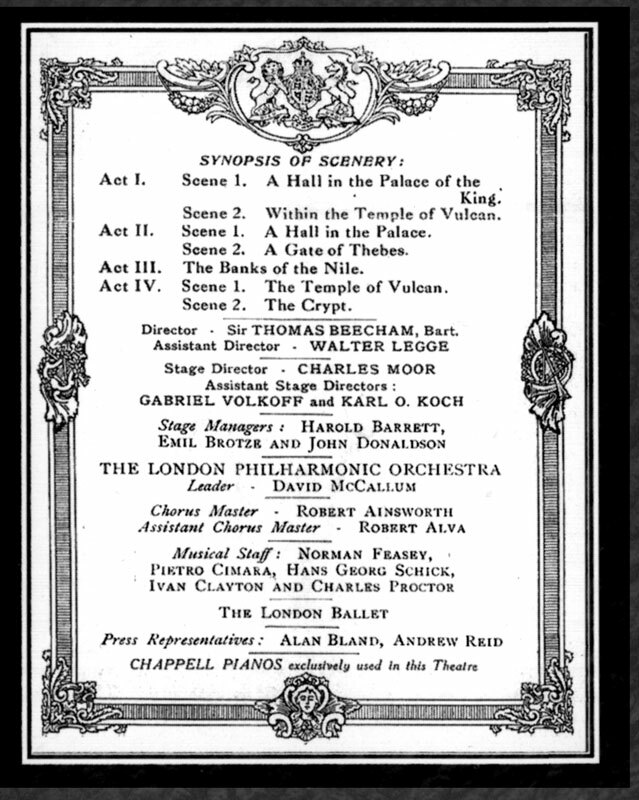 In the “Tomb Scene,” unlike in the 1946 recording, he doesn’t contrast covered with open sounds. He covers “O terra, addio,” whereas in 1946 he sings it in mezza voce, to better effect. His B-flats are better here, however. Indeed, the one in the duet with Stignani, on “vita!” is thrilling. Stignani ignites here, unlike in the 1946 Aïda, particularly in the duet with Gigli. 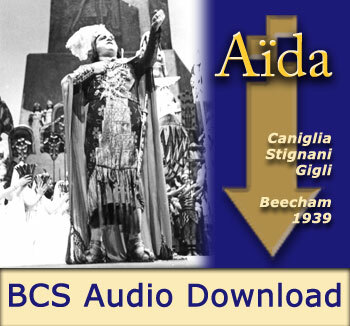 Gigli pushes Beecham’s tempo in “Celeste Aïda.” Beecham is at his best in the prelude, also in the orchestra and dance music in the Act II finale. The chorus is uninvolved dramatically and flat on high notes, but the orchestra playing is cleaner than in the 1946 recording.